Quiltshopgal, over here.... http://quiltshopgal.com/2015-free-motion-quilting-challenge-february/ is doing another challenge this year, and this is our second month. We had options...I chose #1, which was to use the railroad tracks by Leah Day in the 2012 challenge. 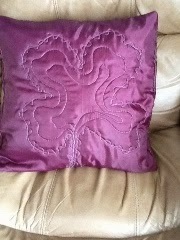 Quiltshopgal also prompted a four leaf clover since St. Patrick's Day is coming up....so, I combined those in my pillow. My pillow is a funky version, which was suppose to resemble the way photos can be distorted....I've only seen it on Facebook, don't actually know how to do it. My grandson does it to my pics once in awhile!!' Lol. 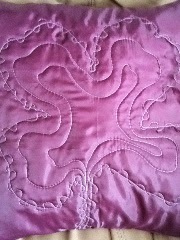 You will see that I didn't do any dense quilting behind the clover as I wanted to focus on that funkiness!!!!!! I used a silky material with Glide thread top and bottom. It went well, but I found the fabric really slippery to hold on to. check out some of the others At the link above....there are some who put extreme work into their pillows. Very cute. Lovely quilting. And that purple is gorgeous. Your purple satin shamrock is very pretty! Don't you just love Glide? It is my most favourite thread for quilting! Hope you didn't get buried in our latest snowfall!! Cute pillow - funky is great! Marjorie, that is a funky pillow. lol but it does remind me of the distorted photos. Glide thread is my go to thread for quilting. I won't hardly use anything else anymore. Those challenges are so interesting. I do like that purple. Interesting quilt design , great job Marjorie ! Beautiful work Marjorie and what neat fabric!